Bring up the Discussions Before it's too late! If I am selling my home and I have moved out of it, do my coverage's change & should I tell my broker? 2. What basis of settlement and limitations are there on personal property and contents? 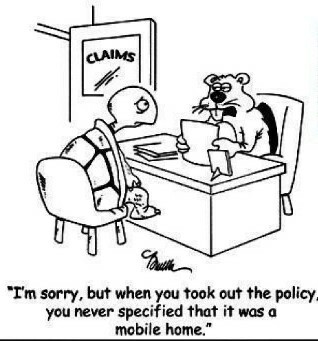 Our home owners policies are designed as packages to include the many aspects a homeowner may need coverage for but what some homeowners may not know is that your personal property and contents are a separate limit and coverage from your dwelling. You should always confirm with your broker because every company is different, on how your personal property will be settled in a claim, for example will you get Replacement of the item or Actual Cash Value (depreciated). As well as, each company has a list on certain items and the max limit that they will provide coverage up to. If you require higher limits on these certain items you will need to schedule them onto your policy to provide that. 3. What are my requirements when I am away from my home, for example on holidays? Again, each company has a bit different requirements when it comes to this, so you should definitely be asking your broker what your insurance company guidelines are for when you leave your home in order to make sure you are still covered as not following their specific wordings on this could void your insurance coverage leaving you hugely burdened financially if there were to be a major water escape accumulating damage the entire time you were on holidays. That is why the wordings around this type of situation have been designed by the insurance companies, to mitigate losses when you are away from your home for an extended period of time and regardless of the wording we always suggest having your home checked on by a reliable person daily. All of these items are also outlined in your booklet of wordings for each insurance company which you can find on our website, or the insurance companies website or we can easily provide you with a copy at your request.